Wide Open Spaces. Endless Possibilities. Own Who You Are. We create ourselves, in part, by plagiarizing the paradigms of our peers. If you’re reading this blog, you probably pride yourself on being an unabashed individual. The truth is, though, that we’re all shaped in part by the creative geniuses of others. Identities are formed as an amalgamation of a broad, cultural circumference mixes with beguiling, individual circumstances. The evolution of who we are as unique persons is the continuation of the story about us as a community of people. That’s exactly why it’s important to see yourself represented. When we see people on TV who mirror our race, religion, or culture, we are reminded that we are part of something larger than ourselves. When we read books about people whose journey parallels some of our own experiences, we take solace in knowing we aren’t alone. The more we are aware of the facets of our collective identity, the better we can hone the individual traits we bring to our unique existence. Our lives are juicier than pulp. Anyone curious homosexuality fifty years ago, though, would have been consigned to flipping through the ragged, untrimmed edges of pulp fiction novels to gain a glimpse into the gay world. The seedy 7”x10” booklets were one of the few sources available where gay and lesbians could read stories about others who were like them. The books were available to the masses at bus stations, newsstands, and dime stores. Sounds like an opportunity to be enlightened, huh? Well, not so much! A bleak sadness permeated most of the works. Titles like The Tormented, The Divided Path, and Lost on Twilight Road pretty much sum up the mood of these titillating tales. Lurid and sexually provocative, most of the stories featured under-developed characters fixated on derelict and destruction. Men were characterized as being internally tormented, homicidal, and dangerous. Women were predatory, suicidal, and insane. Publishing companies had a formula for such works that mandated no character end up happy and gay by the book’s end. They could become straight and be heterosexually partnered; otherwise they needed to commit suicide or be killed. Gay people could never find a shard of actually happiness in these fictitious emulations. How’s that for an identity-upper? 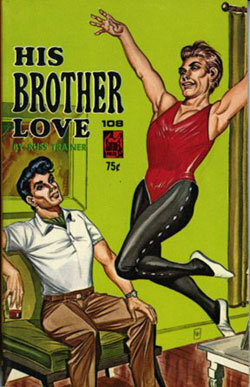 Obviously, pulp fiction didn’t give the gays much literary leverage. Our government and business leaders at that time, though, understood the power of portrayal. They sought to undermine any sense of a burgeoning, gay-positive identity by linking it with anything but happiness. Today, we live in a post-Will and Grace world. Gay representation abounds us. We have our own books, movies, and plays. Hollywood actors and musical pop stars are coming out. LGBT Politicians are being elected. It isn’t just homosexuals who are affected. Now it’s gay guys—not diamonds—that are a girl’s best friends. The straight boys are metro-sexualizing their wardrobes. Your homes are probably flanked in homo-designed styles, too. We’ve come a long way in the fifty years since. Our lives aren’t pulp fiction novels anymore. We can be fully integrated individuals. Today, we’re really just beginning that collective community evolution. The story of American LGBTs is really just starting to be written. What unique perspective will your chapter add?